I see vegan cooks using cashew cream as a substitute for dairy in both sweet and savory applications all over the place lately, so much so that I knew I just had to try it for myself. After making my first batch of the stuff, I really couldn’t believe how smooth and decadent it was. I immediately thought to the russet potatoes I had sitting on my counter and thought of trying my hand at a creamy potato salad. Potato salad typically gets its creaminess from mayo, which I find transforms into an unappealingly oily consistency the longer that it sits. 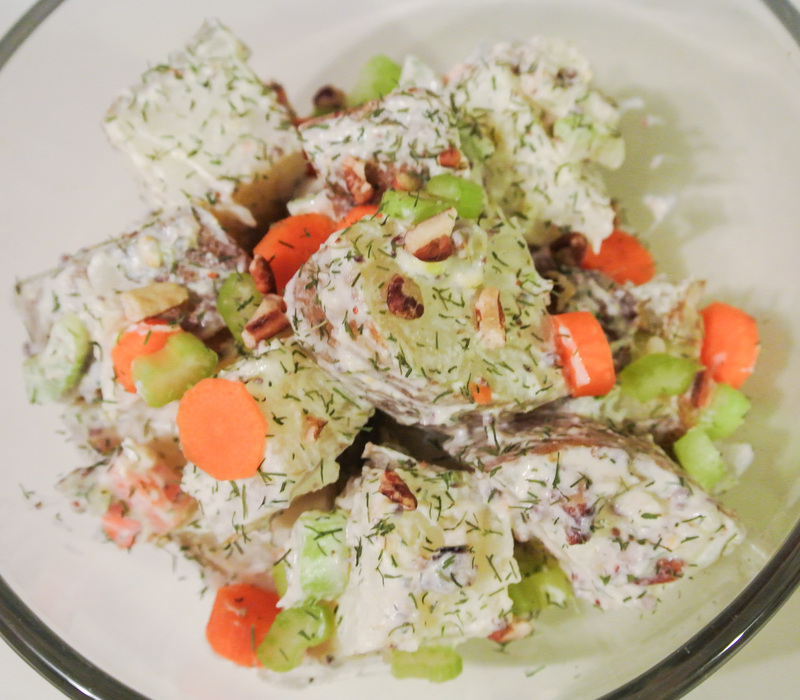 Yes, if you’ve ever been to a good old American barbeque or cookout, you know that potato salad tends to sit…for a while. Even if everyone has a healthy helping, there always seems to be tons of it left over. I’m happy to report that using cashew cream in lieu of mayo will keep your potato salad leftovers fresh and creamy. 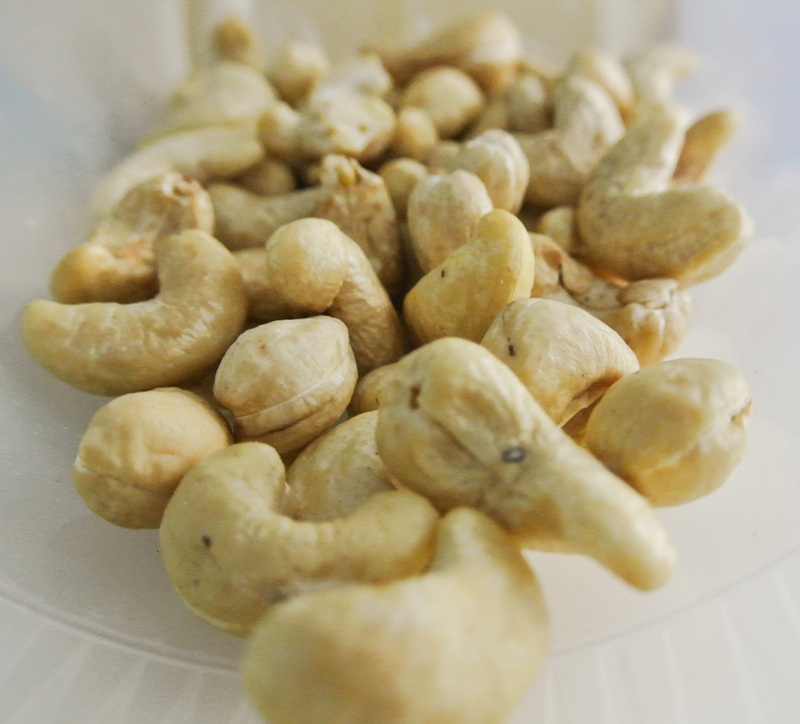 In addition, cashews are nutritious and versatile. These super nuts contain an abundance of antioxidants, are excellent sources of copper and vitamin K, and can even help to lower blood sugar and cholesterol. 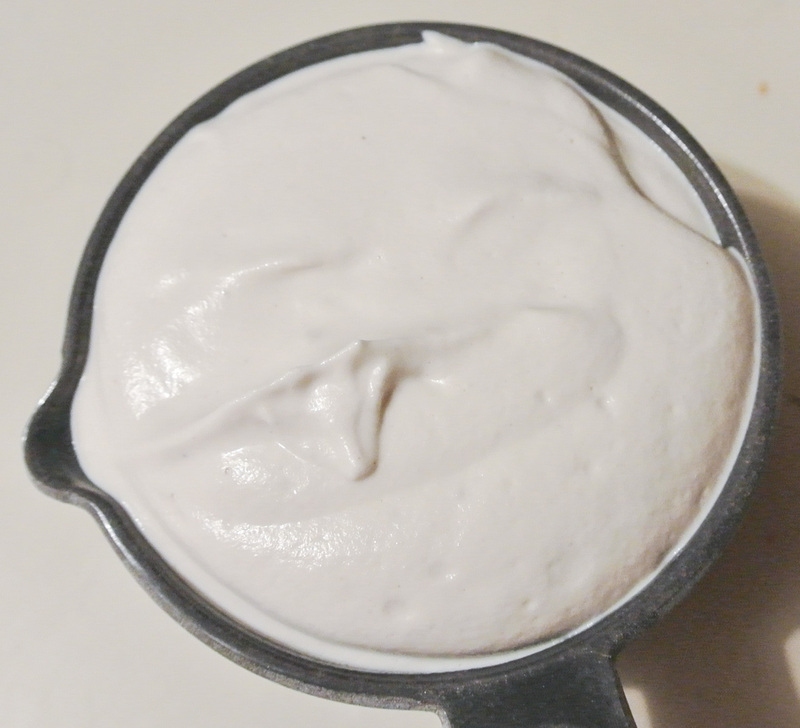 They can be used in everything from trail mix to brittle to vegan cheesecake (a future blog post) and today, as “mayo.” Just blend raw cashews with water; it’s that simple! The other major component of my potato salad is, naturally, the potato. Today, I’m using russets so that I have a blank flavor palate to start with, but you could certainly use a sweet potato, yam, or potato of a different color or texture. 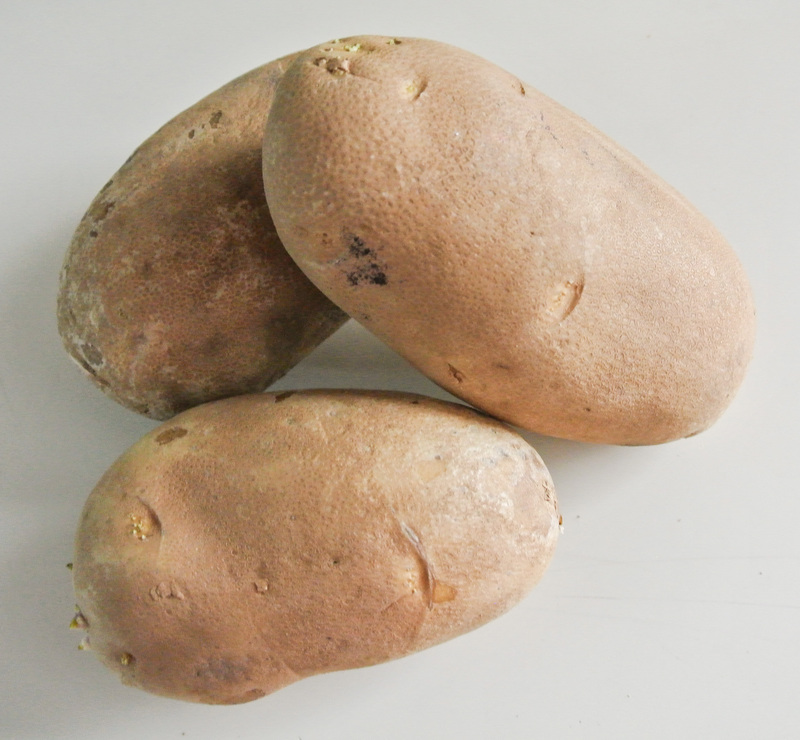 Because, in America at least, the russet potato is often used in relatively unhealthy dishes like fries and chips, it has developed a poor reputation. The reality, however, is that the russet is quite the super food. One large russet contains about a third of your recommended daily intake of vitamin C, niacin, magnesium, and phosphorous. It’s low in calories, high in fiber, and the perfect canvas for endless kitchen experiments. Want to maximize the nutritional benefits of your russets? Leave the skin on! Roast it and it becomes crispy, or, in today’s potato salad, hide it almost entirely in our cashew cream. 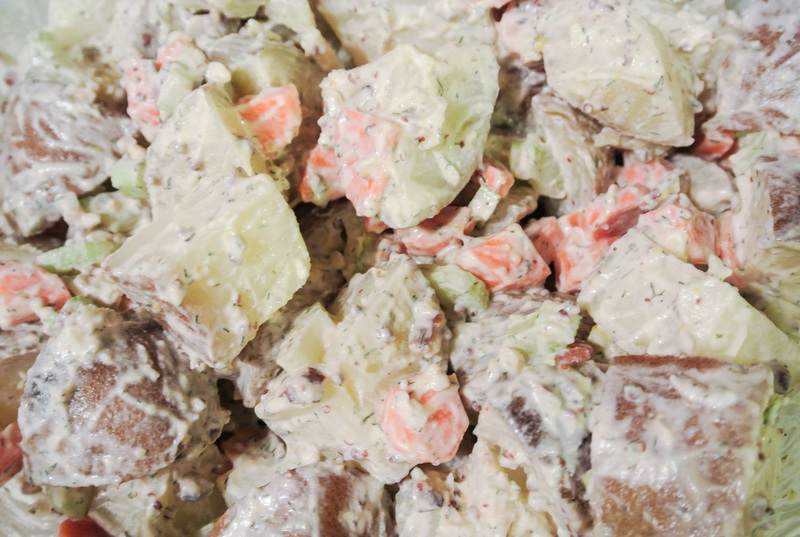 Since I touted my rendition of creamy potato salad for its ability to hold up at the family picnic, you should know that it tastes even better the second day. 🙂 Enjoy! 2 pounds potatoes –> I’m using russets. 2 cups diced raw vegetables –> I’m using 2 medium carrots and 2 large ribs of celery. ¼ cup crunch (raw seeds, nuts, etc.) (optional) –> I’m using pecans (and a small amount of pistachios leftover from my nice cream recipe earlier this week). ½ cup seed or nut butter –> I’m using cashew cream (soak raw cashews overnight and blend with just enough water to form a thick cream). 5 tbsps acid (citrus juice, vinegar, mustard, or a combination) –> I’m using half freshly squeezed lemon juice and half whole grain mustard. Thinning liquid as needed (ideas: homemade veggie stock, water, or more acid) –> I’m not using any. Up to 4 tbsps raw garlic and/or fresh/dried herbs and/or spices (optional) –> I’m using 2 ½ tbsps minced garlic and 1 tbsp dried dill. 1-2 tsps sweetener (optional) –> I’m using 1 tsp agave syrup. Pink Himalayan sea salt and pepper to taste –> I’m using ¼ tsp salt and no pepper. Thoroughly wash your potatoes so that you can keep the skin on. Chop into bite size pieces and steam, boil, or roast (I’m boiling). While your potatoes are cooking, make your dressing. Cover and place in the fridge for the flavors to come together. When your potatoes are done cooking, drain (if necessary) and place in a glass bowl to chill in the fridge, at least to room temperature. While the potatoes are cooling, chop your veggies and crunch element, if using. 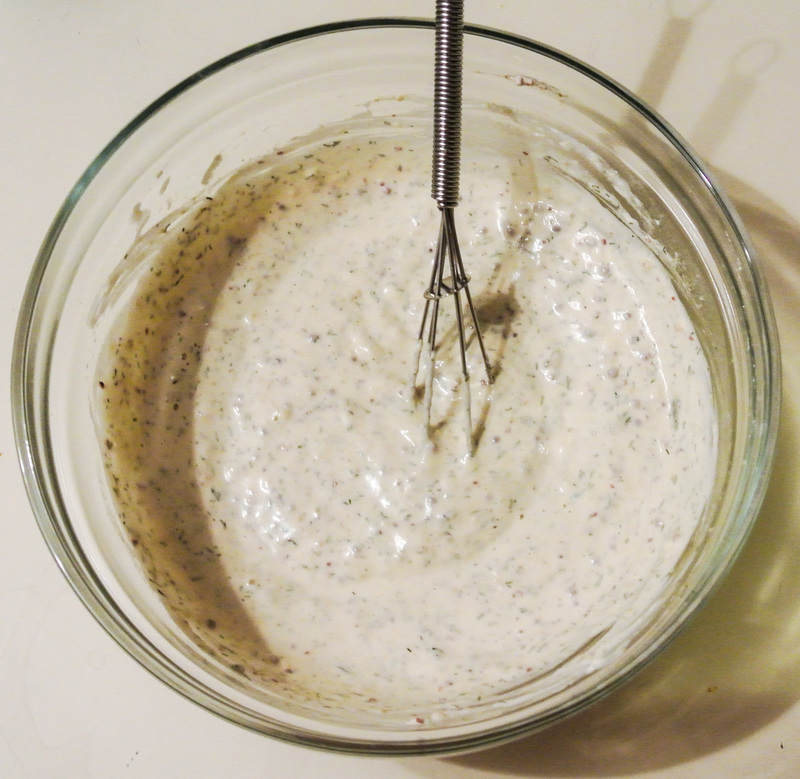 After the potatoes have cooled sufficiently, pour your dressing on top and stir gently to combine. Enjoy for several days (if you have any leftovers!). ← We All Scream for Nice Cream!